Students in Costa Rica attend school between February and December so they have about 2 whole months off with very little to do. In January of this year the center provided the students from the neighbooring communities with a two week multicultural camp where we focused on the environment, art, culture, and exercise. The students were involved in a myriad of activities with an emphasis on environmental conservation throughout the camp. Recycling was a major theme at the camp; the students created maracas, rain sticks, pinyatas, and pin wheels out of recycled material. Students made their own personal passports with their photo and the countries they plan on visiting. Students made picture frames out of fallen tree branches where they inserted pictures of them in the400 year old giant Almond Tree at Selva Verde Lodge. 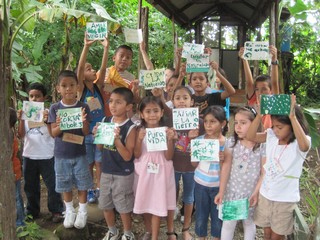 We visited our good friends over at Chilamate Jungle Eco Lodge (http://www.chilamaterainforest.com/index.php?option=pros) where the kids created signs about being eco friendly to put up around the trails at the lodge. The kids went on a nature hike with a Naturialist guide where they learned about the medicinal plants found in their backyards. The studens learned how to make braceletes and necklaces out of materials in the center and wore them proudly. The students learned how to do yoga and Capoeira (an Afro-Brazilian art form that combines elements of martial arts, music, and dance) and learned about the Food Pyramid. All the volunteers were able to participate in the camp which gave them all a great introduction to life in Sarapiquí. All the students still visit us daily for the After School Program so it is nice to still be able to see their friendly faces!